Hi everyone! It's time for a new issue at Paper Issues and I have a little tutorial for you as well. The new issue is called Mix Tape and it's sponsored by Hazel & Ruby. They provided us with some awesome rolls of washi tape to play with and for you there's your chance to win a fabulous goodie bag filled with Hazel & Ruby products! For this issue I wanted to make an altered item and incorporate the Hazel & Ruby alpha masks that I have, as well. 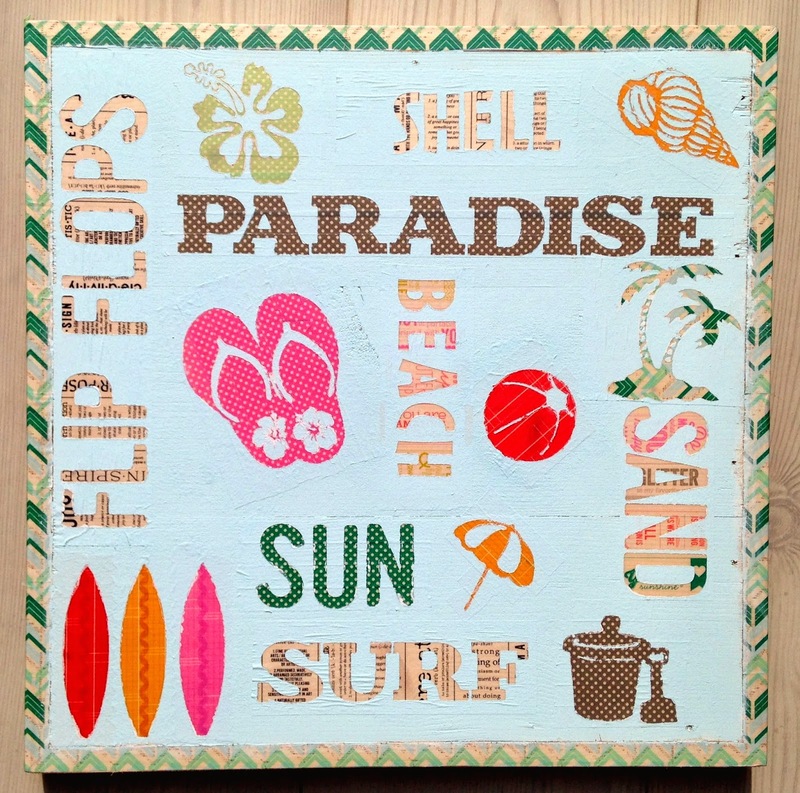 So I went for this wooden sign/subway art project with a beach theme. 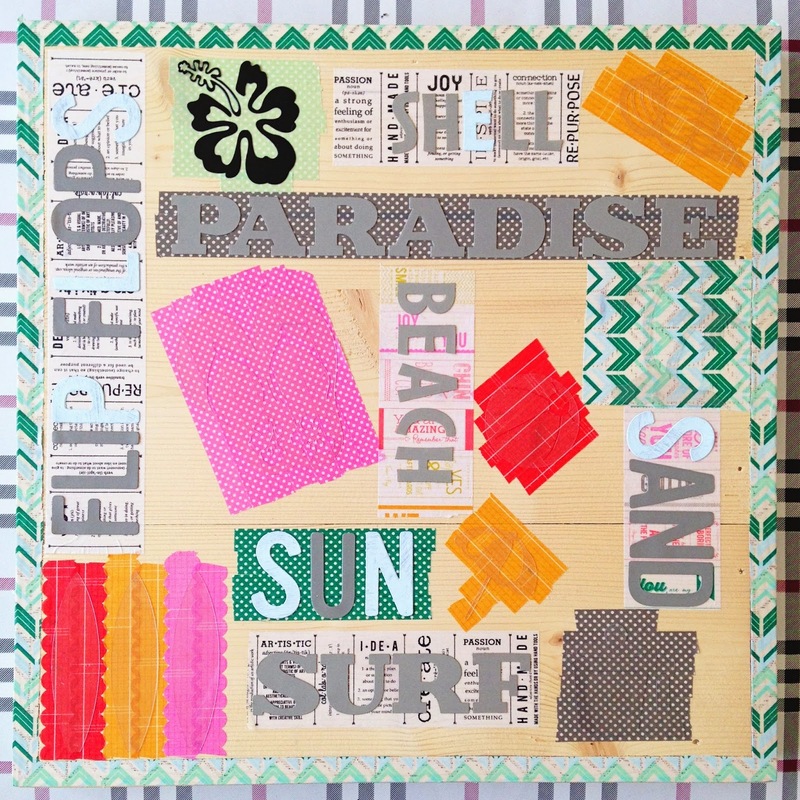 My Dad made me some of these wooden canvases and I've worked with one of them before, which you can find overhere. Below you'll find a tutorial on how I've made this one. 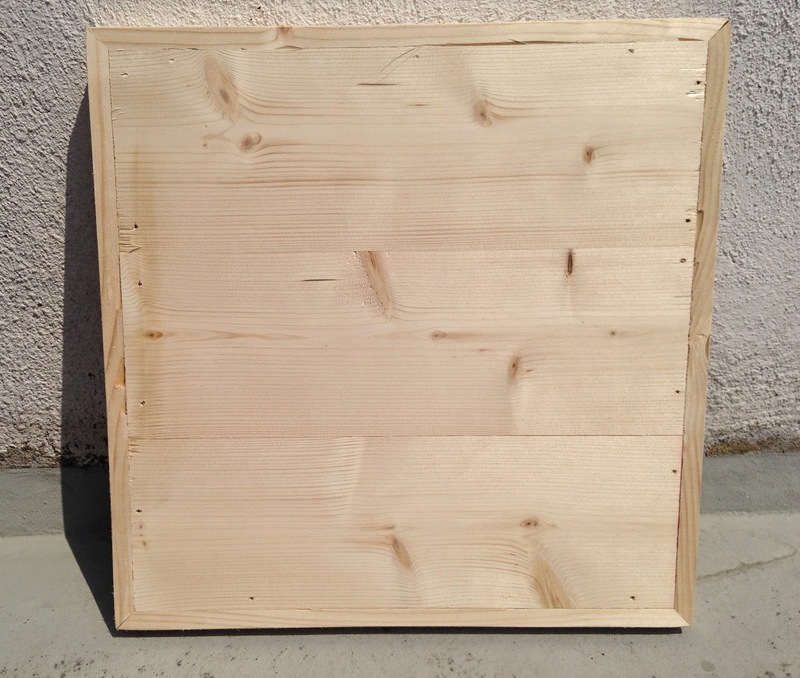 So this is what the wooden canvases look like. They are about 16x16 inch (40x40cm). I started covering the edges and the sides with one of the Fat Roll tapes 'Crazy for Chevy Teals'. Then I used the Blindside, Brooklyn and Central Park alpha masks to set up a little piece of subway art. I used my Silhouette to make some beach theme masks to fill up the gaps. 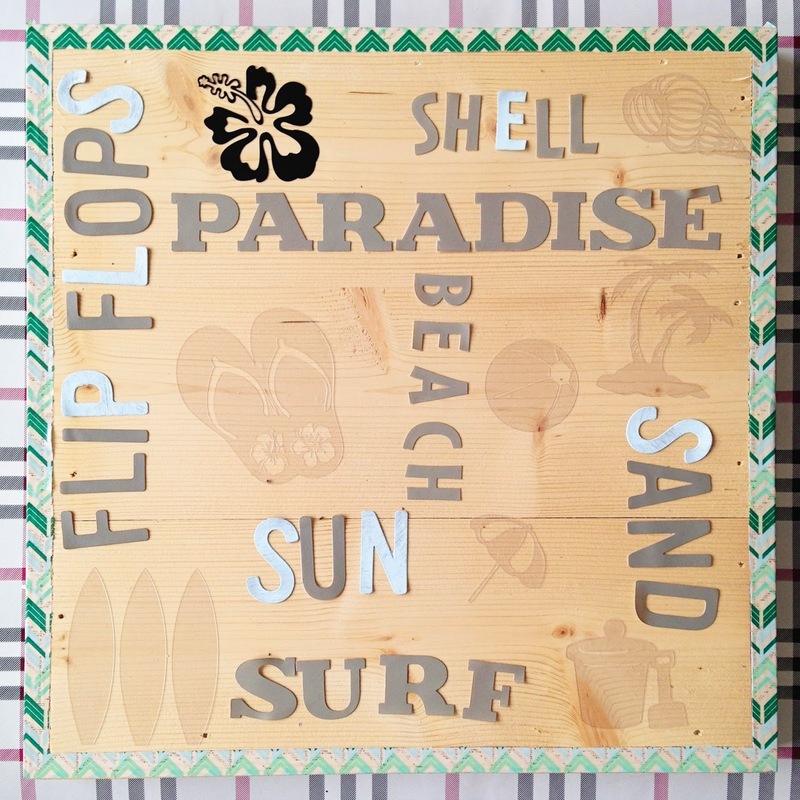 Silhouette has stencil material to easily make your own stencils. Below you see a quick set up of my design, which was only needed to know where to place my washi tapes. So the next step is to place washi tapes under all the masks, a different print and color under each mask. I used the Quote Me, Define It and Crazy for Chevy Teals Fat Rolls and the Scallop Away Colorful Ledgers and Polka Dot Party sets. When you're all set, you can start painting over it. I did a layer of white paint first to cover the tapes better and then painted it over with light blue. Before the paint is completely dry, you remove all the masks and you're done. Now it's time for you to link up your projects overhere at Paper Issues and you might be our lucky winner of the Hazel & Ruby goodie bag!! You can find Hazel & Ruby overhere on Facebook, be sure to follow them and say hi. This is FABULOUS! I love love love love the colors and the different words you added!!!! Awesome project Danielle!! 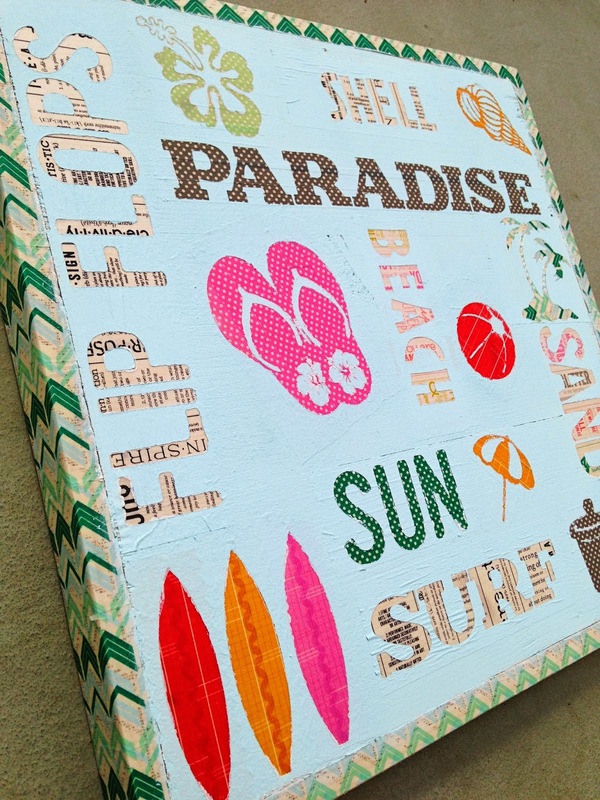 That canvas is fab, and I love the way you used the Hazel & Ruby products to creat the subway art look! WOW this is amazing, great job girl.